How to assign loadlines ? Loadlines are marks punched into and painted on the sides of general cargo ships. These Plimsoll marks take their name from the politician Samuel Plimsoll . The Merchant Shipping Act 1876, gave the Department of Trade and Industry UK, as we now know it, the right of inspection, to ensure that a vessel should not be overloaded beyond her Plimsoll mark or line. The assigning of the vessels loadline and the issue of the Certificate is the responsibility of the Marine Authority of the country. The loadline survey being conducted in accord with the International Conference on Load Lines, 1969, the Merchant Shipping (Survey and Certification) (Amendments) Regulations 2000 and the 1988 SOLAS and Load Line Protocols. 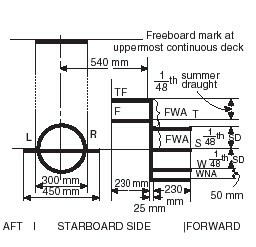 The calculation regarding the freeboard, and consequently the position of the loadlines, will be dependent on the type of vessel and its length, ships being divided into two types ‘A’ and ‘B’. Type ‘A’ – Vessels designed to carry only liquid, bulk cargoes, e.g. tankers. Type ‘B’ – All other vessels not governed by the Type ‘A’ definition. With the exception of pleasure yachts, warships and the like, the majority of vessels of all maritime nations over 80 net registered tons are obliged to be marked with statutory loadlines, to ensure that they are not overloaded. A loadline certificate must be displayed in a prominent place aboard the vessel.The certificate is valid for five years, but an annual survey is held to ensure that the conditions of assignment and the loadline marks remain unchanged. Should the loadline be submerged through the overloading of the vessel, so contravening the regulations then the master or owner is liable to a fine as set by the administration for every cm or part of 1 cm overloaded.The upper edge of loadline marks are the recognised mark levels.The loadline itself is punched into the shell plate and painted a distinctive colour, usually white or yellow on a dark background. Many vessels now employ computer loading programmes to establish disposition of cargo, ballast and stores. Such software can be beneficial and avoiding vessel being overloaded. It is a statutory requirement that the ship is not to be loaded beyond the limits specified in its loadline certificate. The appropriate loadline marks on the ship side must not be submerged at any time during the seagoing voyage. End hold trimming to maximise cargo carrying capacity and bring the ship down to her marks- is to be avoided, as it may result in the overloading of end holds beyond allowable limits, increasing local and global stresses. The Concentrated Inspection Campaign (CIC) on Structural Safety and the International Convention on Load Lines was carried out in the Tokyo MOU region from September 1, 2011 to November 30, 2011. This campaign was conducted jointly with the Paris MOU while regional PSC regimes of the Vina del Mar Agreement, the Indian Ocean MOU, the Mediterranean MOU and the Black Sea MOU also participated in the campaign. The 18-member authorities carried out a total of 7,534 PSC inspections, which included 5,901 CIC inspections. During the campaign, 2,929 CIC-topic related deficiencies were found with 83 ships out of a total of 346 detentions being detained for CIC related deficiencies. The detention rate for the CIC is 1.41% while the overall detention rate for the period is 4.59%. The highest number of inspections were carried out on ships under the flags of Panama 1,900 (32.20%), Hong Kong (China) 468 (7.93%), Liberia 366 (6.20%) and Singapore 347 (5.88%). The flags with the highest number of CIC related detentions were Cambodia 23 (27.71%), Panama 21 (25.30%), Sierra Leone 7 (8.43%) and Vietnam 7 (8.43%). Bulk carriers were the ship type with the highest number of CIC inspections which accounted for 1,898 (32.16%), followed by general cargo vessels 1,565 (26.52%) and container vessels 983 (16.66%). The most significant deficiencies found during the campaign were related to the protection of openings (Ventilators, air pipes, casings) 554 (18.91%), followed with casing (Hatchway-, portable-, tarpaulins, etc) 273 (9.29%) and Doors 245 (8.36%). The Port State Control Committee will consider the final analysis of the campaign's results in April 2012.